Star Trek Mac Lost In Space? 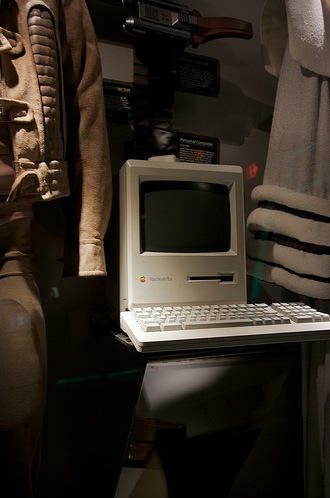 This is the actual Mac plus that Scotty tried talking to in Star Trek IV, spotted and photographed by Marcin Wichary at the Star Trek: The Experience exhibition shortly before it closed last month. Note how shiny and clean this particular Plus is. Bet it boots up shiny and clean, too. And if it has problems, it can run a Level One Diagnostic. Now that the Experience has left the Las Vegas Hilton, it has no home of its own. Where is this Mac now? Probably packed away in a container somewhere. Possibly wrapped up in Spock’s Vulcan gown that it was once displayed alongside. Photo used under Creative Commons license. Thanks to Marcin Wichary.